What Can I Do About My Cold Hardwood Floors? It’s winter! Which has a lot of wonderful traits, but with it comes the cold. And it’s hard to convince yourself to get out of bed when it’s still dark outside; even worse to convince yourself to step your bare feet onto cold hardwood floors. And sometimes, even wearing fuzzy socks doesn’t help to keep the chill out. Hardwood floors help make your home look more elegant. And you should be able to enjoy them no matter what season it is. Fortunately, there are many ways to alleviate the chill. 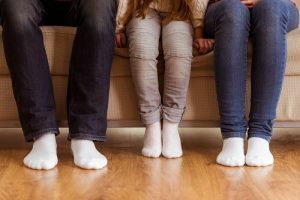 You’ll first need to determine the extent of the issue as there are many possible reasons why your floor might be cold. Is this problem in one room or area, or all over your home? Do you notice the chill every day or only on the coldest days of the year? One quick and easy solution, especially if your floors are cold only in certain spots, is to add rugs. This will provide you with insulation and warm places to walk. Rugs are especially useful in doorways. They have the added bonus of complementing your home decor. This is a great temporary solution for the coldest spots in your home. But it won’t get rid of the problem, and you can’t put rugs everywhere in your home; there’s a reason you want hardwood floors instead of carpeting, after all. If you want a more permanent solution, it’s time to look into the cause of your cold floor problem. It’s easy to focus just on the fact that your floors are cold. But maybe the problem doesn’t lie with your flooring at all. Maybe it’s your home’s heating system instead. Have your heating system and air ducts inspected, especially if you haven’t had them checked in a while. It’s important to keep them maintained and working efficiently. Over time, they can become blocked with debris or develop leaks making them less efficient at delivering the warmth you crave. On top of getting your heating system checked, you can also try turning your ceiling fans on if you have them. You might think of fans as just for cooling you down in the summer. But they’re useful in the winter, too. Since warm air rises, the air near to the ground is the coolest air in your home. Ceiling fans can provide added circulation and push down warm air that’s risen, which can help to warm your floors. Your home temperature and your floors can also be made cool by drafty windows and cracked walls. You can replace the weatherstrip seals around your windows and doors. As well, look for any cracks in your walls and baseboards and seal them. Taking these steps will stop unwanted cold air from coming into your home and will keep warm air inside your rooms. With a more regulated room temperature and fewer drafts, your floors will be warmer and your feet will be more comfortable. As a bonus, this can also save you money on your energy bills by not having to overheat your house. And that’s better for your hardwood floors, too. Setting the thermostat too high can decrease humidity levels in your home, slowly drying out your hardwood floors. Over time, this causes them to become warped and damaged; not what you want for your beautiful floors. So it’s good for both you and your floor to properly and regularly maintain your home’s heating system and insulation. If you have an older home, be aware that hardwood floors can become stripped over the years. This means that gaps develop between the boards, allowing the cold air that circulates below your floor to come through. When your whole floor has gaps letting in cold air, it’s equivalent to leaving a window open in the room. No wonder you have cold hardwood floors! Consider draft-proofing if your old floor is stripped. Materials can be purchased fairly inexpensively at your local home improvement store. And it’s simple to install yourself if you’re a handy person. Afterward, your floors should be warmer. If you’d rather have a professional help you repair your aging floors, or if you are in question about whether draft-proofing is the right solution to your own situation, you can always contact us at Wall 2 Wall Hardwood Floors for advice. We can also help you with things like refinishing your older floors to make them look shiny and new without having to replace everything. Maybe you’ve had hardwoods floor for years that you love and don’t want to get rid of. But maybe you’re ready for an upgrade to make your home even warmer and energy efficient, an update so you won’t have to worry about cold hardwood floors ever again. Installing a radiant floor heating system might be the perfect solution for you. This system goes under your flooring and keeps it uniformly warm. This is far more involved than a lot of other solutions, so it’s also the most costly. Wood is more sensitive to changes in heat and humidity than other flooring materials, and not every type of wood will work with a heating system. Engineered wood tends to work well, but certain types of solid hardwood will warp over time from too much heat. You want to maintain your beautiful floors, not have them become a problem in the years to come. Another thing to be aware of is that installing a floor heating system is a major renovation to your home as the heaters go under the wood. This option requires the most thought and planning, but it will give you the most uniformly warm floors. If this is a solution that interests you, talk to a professional, who can help answer any questions you might have about floor heating systems. What if My Floors are Still Cold? If you’ve tried some of the solutions above and your floors remain cold throughout your home, this could be the sign of a bigger problem. Your best solution is to contact an expert who can evaluate your situation and provide you with knowledgeable guidance after assessing your home. At Wall 2 Wall Hardwood Floors, we are happy to answer any questions you might have. This entry was posted in Hardwood Floors on January 15, 2019 by Oregon Hardwood Floors. Why is My Hardwood Floor Buckling? © 2019 Wall2WallHardwoods.com. All Rights Reserved.